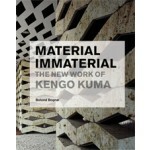 Material Immaterial: The New Work of Kengo Kuma presents more than thirty of the architect's recent works, including high-profile commissions such as the Suntory Museum in Tokyo and the Ondo Civic Center in Kure; the exquisite Lotus House in Zushi; large-scale urban developments like Sanlitun Village South in Beijing; as well as tea pavilions and installations that have exhibited in the United States, England, Italy, South Korea, China, Germany, and France, many of them never before published. 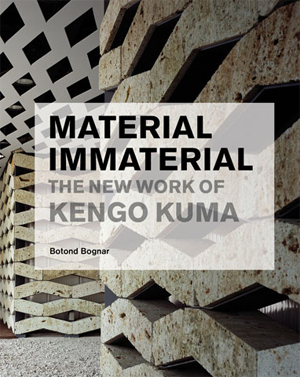 The book also includes an extended essay on the evolution of the architect's work, from the founding of Kengo Kuma and Associates in 1990 to the present. An accompanying exhibit--the first retrospective of the architect's work, also titled Material Immaterial--displayed at the University of Illinois at Urbana-Champaign in late 2008 and will travel to locales around the world over the next two years. In the monograph Kengo Kuma: Selected Works, celebrated architect Kengo Kuma boldly declared that his ultimate aim was to "erase architecture" so that his buildings became one with their surroundings. In recent years he has pursued this goal by focusing primarily on imaginative and unexpected use of materials, creating hypnotizing surfaces that evoke subtle visual sensations by highlighting their materiality. Only by pushing a material to the limits of its capabilities does Kuma believe their true nature can be revealed. Ingenious and yet deceptively simple, this realization represented a major turning point in his desire to give his architecture a presence beyond the merely eye-catching or sculptural.